What makes each person with autism so different from each other? How do you learn to 'speak autistic'? What are the low cost and no cost strategies to help people with autism manage their own particular collection of challenges? Published in 2005, The Jumbled Jigsaw is an easy to read, 'quick dip' self help manual on the 'Fruit Salad' model of and approach to the navigation and management of autism. It exposes autism spectrum disorders (ASDs) not as single entities but as a combination of a whole range of often untreated, sometimes easily treatable, underlying conditions. Exploring everything from mood, anxiety, obsessive-compulsive and tic disorders to information processing and sensory perceptual difficulties, including dependency issues, identity problems and much more, it demonstrates how a number of such conditions can combine to form a 'cluster condition' and underpin the label 'autism spectrum disorder. 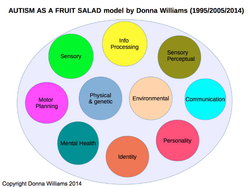 Most importantly it gives case study examples and clear strategies for management of each piece of autism spectrum 'fruit salad'.